Introducing the NEW Godiva Natural Skincare! Back with a better formula, a new packaging and with more promising results, Godiva Natural Skincare range uses the proven power of licorice in effectively and safely whitening the skin. Extracted from one of nature's most effective skin whiteners - licorice root extract - Godiva gives you white skin that truly lasts. "Angel Locsin - Philippine Beauty"
AT LAST, WHITE SKIN THAT LASTS! you are back to your normal skin color. Well, that's not the case with the new Godiva Natural Skincare. How does licorice whiten skin? In the early '90s, Japanese scientists isolated certain compounds in licorice. Glabridin was identified as a powerful skin whitening ingredient, glabrene as an anti-oxidant as strong as natural Vitamin E, and licochalcone as highly effective anti-acne ingredient and a mild sunscreen. The glabridin in licorice whitens by suppressing the formation of melanin, the pigment responsible for skin discoloration. Over time, the old layer of the pigmented skin is replaced by whiter, creamier skin. What is so different about Godiva Licorice? The combination of science and nature makes Godiva Licorice the most effective skin whitening line in the market today. Godiva uses only purified licorice with the highest glabridin content (40%). There are only minute quantities of glabridin in licorice extract. The challenge is to isolate glabridin and concentrate it consistently to create a powerful skin whitener. With advanced state-of the art technology of isolation and separation, Godiva has come out with a new generation of skin whiteners. How about safety? Are there possible side effects? Licorice is absolutely safe. It has been used for hundreds of years as food additive and flavoring. And even better proof is its acceptance by the Japan Food and Drug Administration (JFDA) as a quasi-drug (treatment cosmetics) safe for long-term use. Japan FDA is well known to have stricter product registration requirements than even the European and American FDAs. The Philippine Bureau of Food and Drug (BFAD) has also approved Godiva licorice after local clinical trials showed no incidence of irritation, allergy or redness. Do you have a regimen for skin whitening? 1. 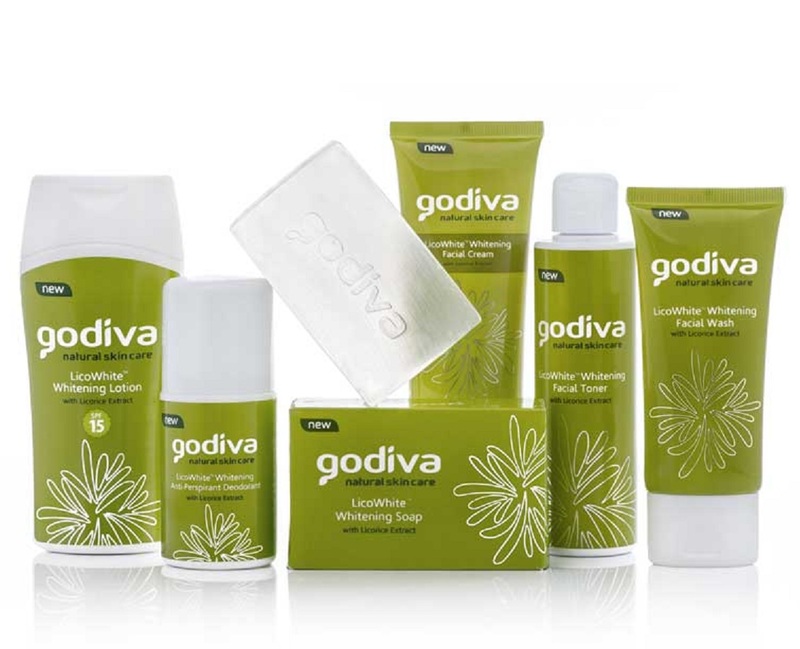 Start by washing face with Godiva Licorice Whitening Transparent Soap. 2. 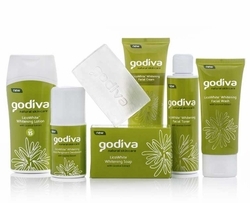 Follow with Godiva Licorice Skin Whitening Astringent, if your skin is normal to oily; or the alcohol-free Godiva Licorice Skin Whitening Toner, if your skin is prone to dryness.Godiva Licorice Whitening Transparent Soap. 3. Apply Godiva Licorice Skin Whitening Cream on face, neck and other sensitive areas, and Godiva Licorice Skin Whitening Lotionon other body parts. Do this twice daily. Godiva Licowhite Whitening Soap cleanses and whitens as it evens out skin discoloration. A gentle and non-drying cleanser enriched with Glabridin from Licorice for brighter, fairer skin. An amazing whitening cream that cleans and refreshes as it helps even out skin discolorations caused by age, pregnancy, scars or overexposure to the sun. Cleans and refreshes as it helps even out skin discolorations caused by age, pregnancy, scars or overexposure to the sun. For normal to oily skin.